Michel-Pierre Massonie is one of the leading figures not only in Lalande de Pomerol, but also in Bordeaux. He was president of the Grand Conseil des Vins de Bordeaux for 9 years (http://www.grandconseilvinsbordeaux.com/GrandConseilBx_site/welcome.html). Monsieur Massonie is an ardent defender of his appellation and was also one of the founders of the local vinous brotherhood, Les Baillis de Lalande de Pomerol. The wine had a deep color, but the nose is really rather mute. There are nevertheless some violet aromas in the background. There is also a pleasant tartness on the palate. This is very appetizing with blackberry flavors, a tea element, and a lip smacking aftertaste. Not necessarily what one expects from a Merlot-based wine, but fun to drink and enjoyable young. The Chatonnet family has very deep winegrowing roots in the Libourne region. Besides managing Ch. Haut-Chaigneau in Lalande de Pomerol and L’Archange in Saint-Emilion, Pascal Chatonnet also owns and manages Laboratoire Excell, a world-class firm specialized in enological analyses. La Sergue is made from the best 5 hectares of the family’s 22 hectares of vines in Lalande (87% Merlot, 10% Cabernet Franc, and 3% Malbec). The 2008 is looking just about as it should for a 6 year-old wine. The nose shows ripe plummy fruit and subtle mocha overtones. Internationally renowned for his research on the effect of oak on wine, it is hardly surprising that Pascal Chatonnet has mastered barrel ageing to perfection here. There are dried fruit and blackberry flavors on the palate, and a cherry-vanilla component. This is definitely not your easy-going Merlot, because the tannin has loads of character and follows through into good grip on the long and slightly tarry aftertaste. I have followed La Serge for years, and it never disappoints. This 2008 is pleasurable to drink now, but it needs much more time to reach its full potential. 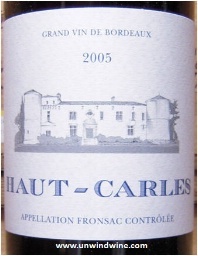 This is the prestige cuvee of Château de Carles, a 14.5-hectae estate in Saillans (AOC Fronsac). The wine is followed by Michel Rolland and comes within the orbit of Jean-Luc Thunevin. In fact, I bought the wine at Thunevin’s boutique in Saint-Emilion several years ago. Haut-Carles has also received praise from Robert Parker, and I was more-or-less prepared to encounter a big Parker-style wine. Big it is, to the extent that it is 14.5% alc./vol. However, the wine is by no means clunky and, mercifully, is not heavily overoaked. The color is very dark purplish-red with thick legs, and looks younger than its years. The nose is rather closed-in, but shows hints of prune, candied fruit, and chocolate. Seeing the alcohol content on the label, I was expecting a “hot” wine. But, no, this Haut Carles is not overbearing or adversely affected by its alcohol content. It is indeed spirity to some extent, but this is ethereal. The wine has a heavy mouth feel and is quite rich. It nevertheless lacks acidity, freshness, and elegance. The aftertaste finishes dry, and the new oak does come through at this stage. Although somewhat one-dimensional, this Haut-Carles is a pleasant enough wine. At ten years of age, is has mostly achieved what it is capable of. Posted in Uncategorized and tagged Bordeaux, Fronsac on May 4, 2015 by AlexR.